A sharp-shooting spacecraft has spotted a candidate Mars Polar Lander touchdown site suggesting that the once lost to the planet probe may well be resting on the surface, perhaps in one piece. That revelation has come via NASA's veteran red planet orbiter, the Mars Global Surveyor, as well as the crafty photo wizardry of Michael Malin and his team at Malin Space Science Systems (MSSS) of San Diego, California. In a statement newly issued on the MSSS Mars Global Surveyor web site, the Mars Polar Lander (MPL) has been tentatively identified. Moreover, imagery taken suggests that the vehicle could be more-or-less intact, sitting in a south pole region of Mars, notes the MSSS web site. "The loss of Mars Polar Lander in December 1999 was a traumatic experience not only for those of us intimately involved in the mission," explains the MSSS web site. "But also for the U.S. Mars Exploration Program. Following the failure, exhaustive reviews of what happened and why led to major shifts in the way planetary exploration was implemented. Without telemetry, the cause of the failure could only be surmised. It would be extremely important if, through some observation, it were possible to confirm the failure mode." Furthermore, given the candidate locale in which Mars Polar Lander may sit, it serves as a target for further imaging by MGS during Mars' southern summer this year. In fact, this month, the prospective landing site is just beginning to shed its cover of seasonal carbon dioxide frost. According to a statement on MPL from Malin Space Science Systems, the MGS photo shows brightness of a candidate "parachute" unfurled on Mars. In addition, the MPL candidate location image also shows a brightness difference in the martian terrain -- conceivably mussed up by the lander's engine blast. Sitting in the center of that disturbed surface is a small, bright spot - ostensibly the one and only, but long silent: Mars Polar Lander. "The observation of a single, small 'dot' at the center of the disturbed location would indicate that the vehicle remained more-or-less intact after its fall," the MSSS web site explains. 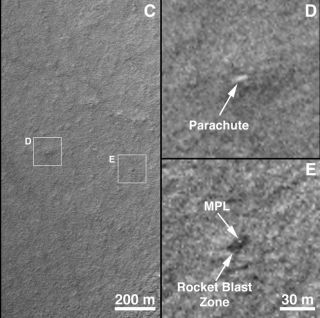 Photo interpretations, notes the MSSS Internet site, seem consistent with the proposed MPL mode of failure as outlined by mishap investigators that hunted for clues to the lander's true fate. That is, the probe's deployment of landing legs sent a faulty message to onboard software suggesting that touchdown had occurred. That flawed signal, it was later deduced by a troubleshooting team, likely shut down the Mars Polar Lander's engines prematurely. The craft then free fell to Mars and became damaged goods on the distant planet. Details of the ongoing detective work regarding Mars Polar Lander -- as well as how Mars Global Surveyor has been utilized to catch sight of other landers on the red planet -- is carried in the July issue of Sky and Telescope magazine, authored by camera sleuth, Michael Malin.